As “Phyllis” and “Ada” make their stately progress east from the portals at Park Royal, plans are evolving for the Crossrail route west, and an absorbing story it is to tell. The Mayor has now published Old Oak: A Vision for the Future, setting out the grand plan for what could become the Canary Wharf of west London. Old Oak Common (OOC) is an emerging transport hub for HS2, Crossrail and the Overground, and the gateway to the huge Park Royal Opportunity Area. This is giving rise to one of London’s most ambitious redevelopments. Make no mistake, this is a project that will transform west London. Crossrail is currently the largest construction project in Europe, Park Royal is the largest industrial estate in Europe, and HS2 is no minnow. The task of weaving the various rail routes into a coherent and achievable whole at OOC has been challenging for the planners. The scheme that is emerging incorporates Crossrail as but one of the elements, and here at LR Towers we’re very happy to be recounting a tale of vision, some joined-up thinking and a step change for rail in west London. The sprawling wastes of OOC lie trapped in the railway no-mans-land between Wormwood Scrubs and the next tangle of lines north around Willesden Junction. At first glance there could be no possible reason for a station here, and indeed Crossrail was expected to speed west to Ealing Broadway, with only a few services pausing at Acton Mainline. HS2 changed all that, however, and the concept of a Crossrail-HS2 interchange emerged. In principle both HS2 and TfL were positive, though neither would commit alone. 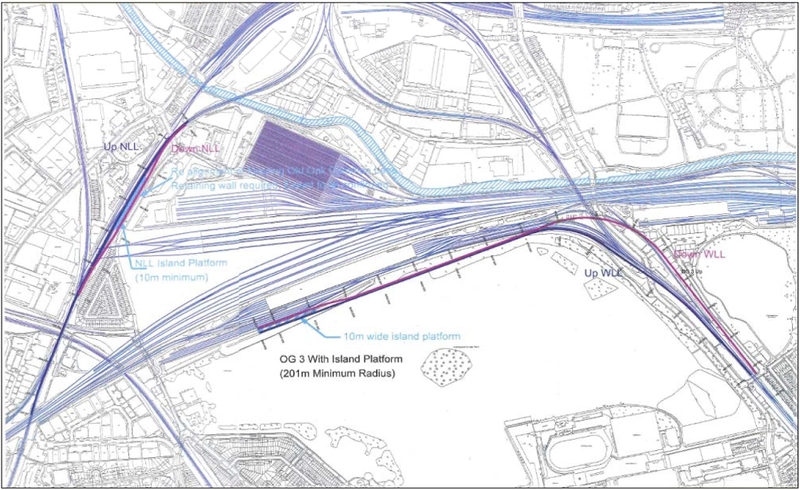 Then TfL raised significant concerns about the broader HS2 design in London and made some requirements of its own, one of which was an OOC interchange with the Overground and Crossrail, largely to relieve pressure on the underground routes through Euston. Step aside for the London Borough of Hammersmith & Fulham (LBHF), which had bolder plans, engaging the architects Terry Farrell and Partners to create a vision for regeneration. Highly ambitious but eminently achievable, as the illustrious Mwmbwls lyrically enthused, this would transform the area into a key transport node and economic hub. The fanfares of 2011 then died down and all went quiet but, intrigued, we followed the plans behind the scenes. It’s some achievement that, in a matter of a couple of years, OOC has grown from the mere seed of an idea to a £10 billion development that may require the vehicle of a Mayoral Development Corporation to push through. An integrated rail plan needs to be in place this year to meet the HS2 parliamentary timescale, and a big question is how this meshes with the Crossrail project timetable. A collaborative design approach is essential, not only to create an effective interchange that allows the various routes to operate reliably, but also to phase the rail works in the midst of a large-scale redevelopment. 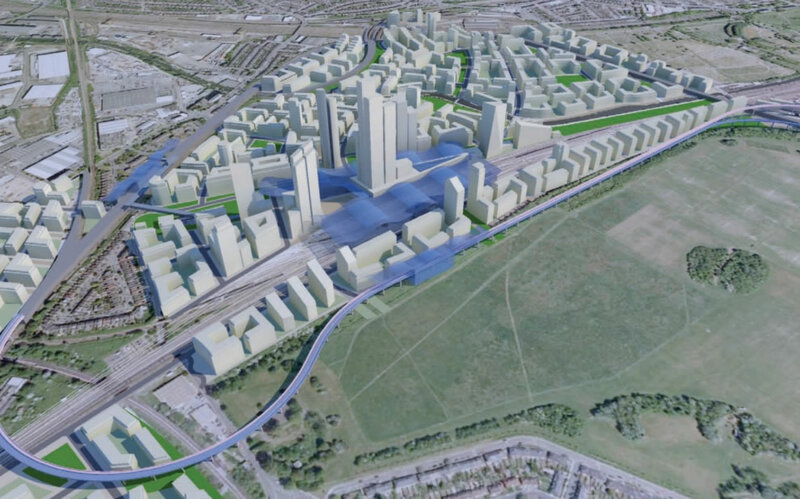 Old Oak Common will not all be built at once – indeed it cannot and (as we outline below) parts of the site will not be redeveloped for 20 or 30 years. An integrated design is one thing, but deciding who pays for it is another. The benefits and costs will be shared between several parties which, for rail, includes HS2, Network Rail, TfL and Crossrail, the TOCs for the GWML and WCML, the freight operators who use the busy orbital lines that criss-cross the site and – last but not least – the DfT. In broader terms the players include the Mayor, the developers and masterplanners and, of course, LBHF. 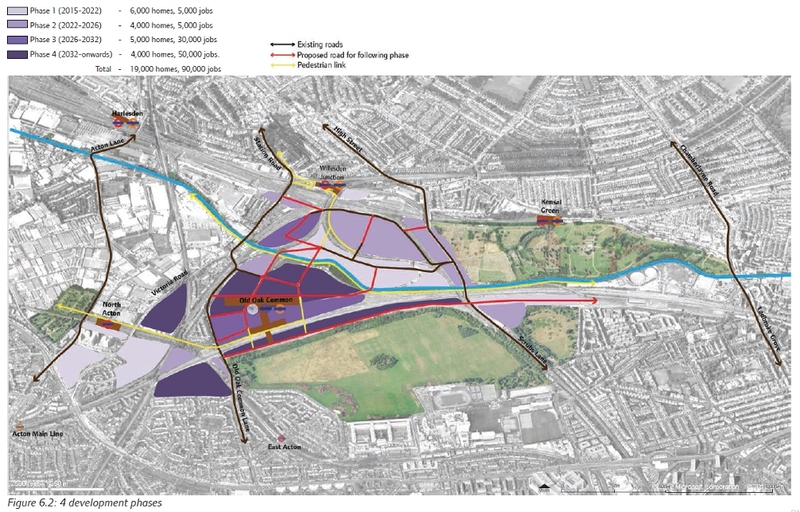 TfL will be particularly aware that Old Oak Common provides a test of its “strategic interchange” concept, and it will be interesting to see the extent to which it is willing to take leadership, and to financially commit. Here in Part 1, we summarise the many strands being pulled together and outline what the planners have come up with, and we emphasise that at this stage this is merely a plan, a Vision; none of this has budget or agreement. In Part 2, we explore the dance between the key players, some nagging questions, and how the decision-making might unfold. The excellent Carto Metro maps help the unfamiliar reader navigate the maze. The slightly edited version below shows the location of the interchange, with orbital connections radiating in all directions. It doesn’t show the proposed route of HS2, and also misses some detail, such as the Great Western (GW) goods line which ran alongside the Central from North Acton through East Acton to the West London Line (WLL). A sense of the expanse of the site comes from the photo below. HS2 will emerge from beneath these lines and the canal above, into a station box similar to Stratford International. The tracks in the foreground will remain to access the Crossrail depot. So to the proposed development itself. 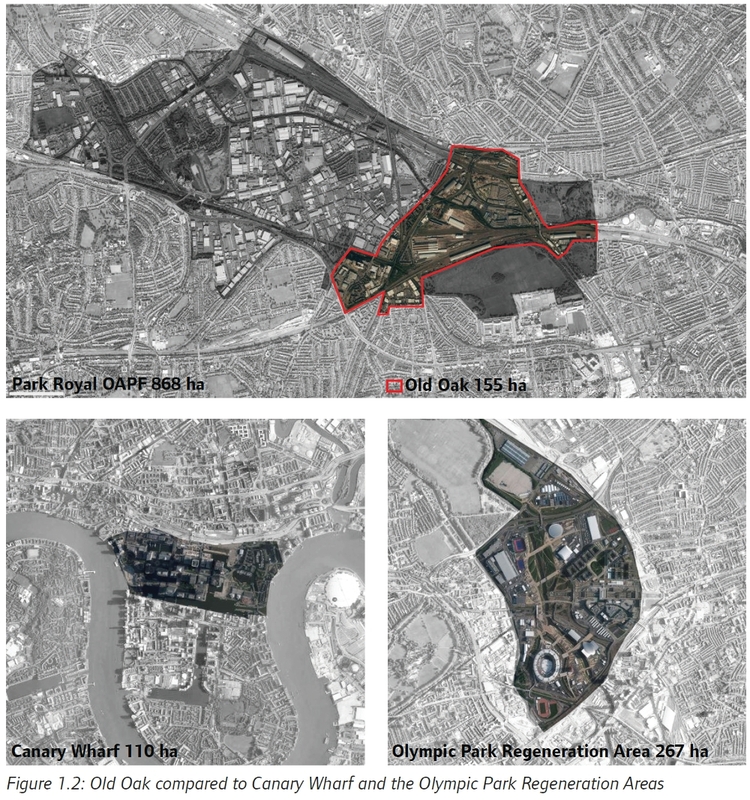 Firstly, the images below gives a sense of the scale compared to Canary Wharf and Olympic Park, which implies that Park Royal will also require a Development Corporation vehicle to facilitate the masterplanning and investment. The core Old Oak area is 155 hectares whilst the wider Park Royal Opportunity Area is 868 hectares, almost 9 square kilometres. The vision is of 19,000 new homes and 90,000 new jobs, with a new interchange station the size of Waterloo, handling 250,000 passengers a day. OOC will become a “super hub” between London and the rest of the UK, Europe and the world. It’s quite a claim, and in Part 2 we’ll explore the implications in terms of London’s rail network as a whole. The first picture above of OOC as it might look in 2043 represents the culmination of a multi-phase development. The phasing is dictated partly by what land is available at each stage, and the inevitability of the Crossrail and Intercity Express Program (IEP) depots means that the planners have had to work around these. The assumption is that these sites will become available for later phases of development, but for now put yourself in the position of the developer or investor. How would you feel about two large railway depots as the centrepiece, taking pride of place in the vista from your new Phase 1 show-home? Success with Phase 1 is essential to help kick start the regeneration of the wider area and raise the value and viability of later phases. Success will also improve the business case for new transport links, including new stations for the Overground and the a GWML. With HS2 and Crossrail construction dominating the space at Old Oak Common itself, Phase 1 of the broader Old Oak development is expected to be north of the canal and around North Acton station. The space immediately around the HS2 and Crossrail stations would not become available until Phase 3 (2026-32), while the Crossrail and IEP depot sites will not become available for development until Phase 4, from 2032. Next, to the project that provided the initial driver for all this: HS2. 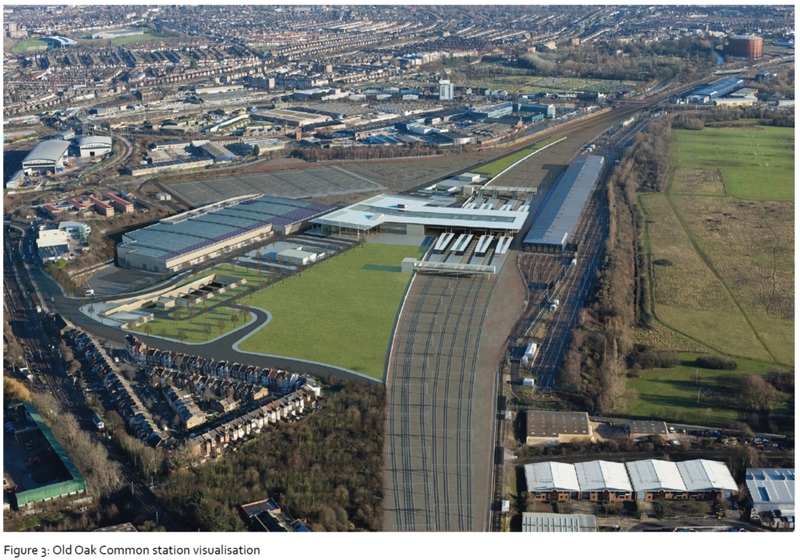 Unsurprisingly the design for the HS2 station at Old Oak Common bears an uncanny resemblance to Stratford International. Despite the acreage available, the site options for a high-speed station are very limited, constrained by housing in the west and the Grand Union Canal looming above the Crossrail depot access tracks in the east. The HS2 station is located where the existing Heathrow Express and First Great Western Intercity 125 depot now lies. This will become redundant when the Intercity Express (IEP) depot opens on the south side of the tracks at North Pole, alongside Wormwood Scrubs, and when Crossrail takes over Heathrow services. This large site, the erstwhile Eurostar depot, constrains the Old Oak Common station site on the south side, of which more below. Six platform lines are envisaged for the 400m trains and the station will be sunk around 15m below the existing rail lines. The central island platform will be for international services via the proposed HS1-HS2 link, which can be segregated for border control purposes. Three running tunnels will head east, the central bore being the HS1-HS2 link to emerge around Primrose Hill. The on-going debate over the HS2-HS1 link will be left for another post. Suffice to say now that question marks over the route east from OOC will not materially alter the layout of the station itself, although the routes offered from OOC may change if, for example, the planners pursue opportunities for new cross-London regional services using a redesigned HS1-HS2 link. 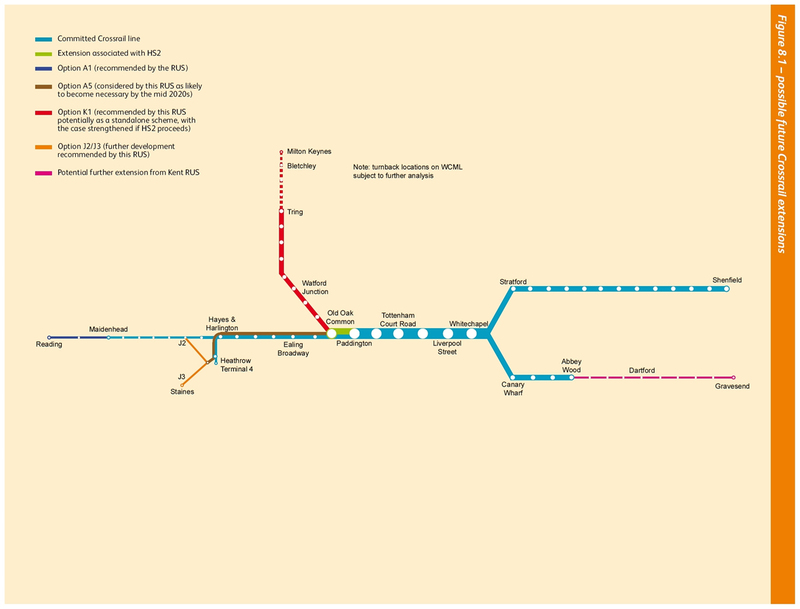 HS2 revised route, published Jan 2012, drawing # HS2-ARP-00-DR-RW-05301. The image quality suffers from the need to resize for the web and we recommend readers to download the PDF. Compare this to the most recent plans in the Draft Environmental Statements presented to consultation groups. Map published as part of the Draft Environmental Statement for the current HS2 consultation, section Scrubs Lane to Wells House Road. The image quality suffers from the need to resize for the web and we recommend readers to download the PDF. There are two significant changes at OOC. Firstly, the HS2 axis has moved more towards East-West, to avoid housing at the west end around Acton Wells. The result is that the eastern end of the HS2 station now lies beneath the Crossrail/GWML station on a raft. Secondly, the Crossrail/GWML station has been relocated eastwards, also partly necessitating the raft over the HS2 station. This is so that all the station platforms are grouped centrally and aligned with the proposed North-South pedestrian ‘greenway’ through the development. It also provides sufficient space for Crossrail turnback sidings, which would then become part of a grade-separated junction for the WCML branch. 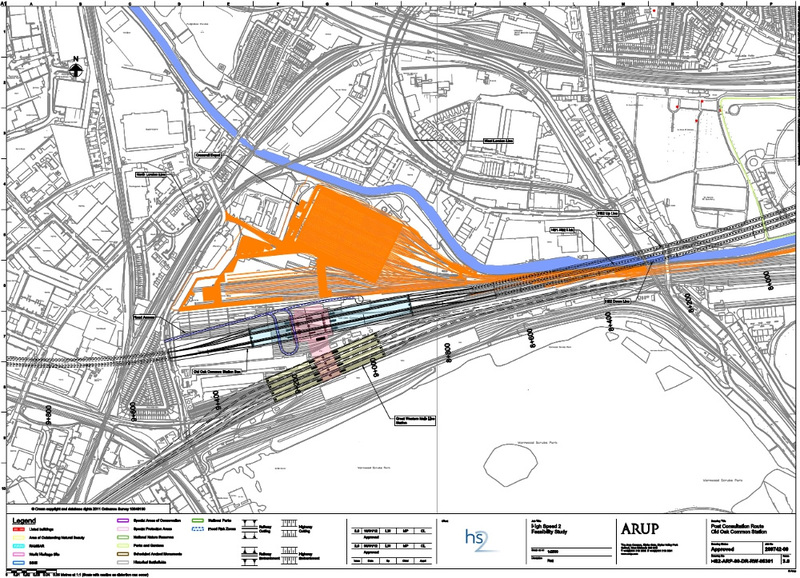 The 2013 plan also clarifies the layout of the Crossrail depot, with a bank of stabling sidings on the north side closest to the canal, and the maintenance depot adjacent to the HS2 station to the south. This is important to the development as a whole because it may be easier building a raft above stabling sidings than over a maintenance depot. Plus, in the event of Crossrail being extended westwards, it will probably be more straightforward to create new stabling facilities elsewhere than relocate the maintenance depot. The end result at OOC might well be that the Crossrail stabling sidings are redeveloped but the maintenance depot stays. As we piece together the components in this complex project, the main engineering consideration for LR readers to bear in mind is that the HS2 station is underneath everything else, and therefore needs to be built first. HS2 is also the main economic and political driver behind OOC, at present, so the next obvious question is: will anything get built without HS2? That’s a question we’ll seek to unravel in Part 2, but for now lets take a look at the other components that need to be integrated. A recurring theme in the comments on LR is the questionable wisdom of terminating 14 of the 24 peak hour Crossrail services at Paddington. This was acknowledged in the 2011 London & South East RUS which, noting a looming capacity gap of 5800 passengers in the peak hour on the GWML, looked at options to extend Crossrail services west. But this is a fiercely guarded domain. Crossrail is a flagship TfL project and there is little tolerance of changes that might endanger the project being delivered to spec, on budget and on time. 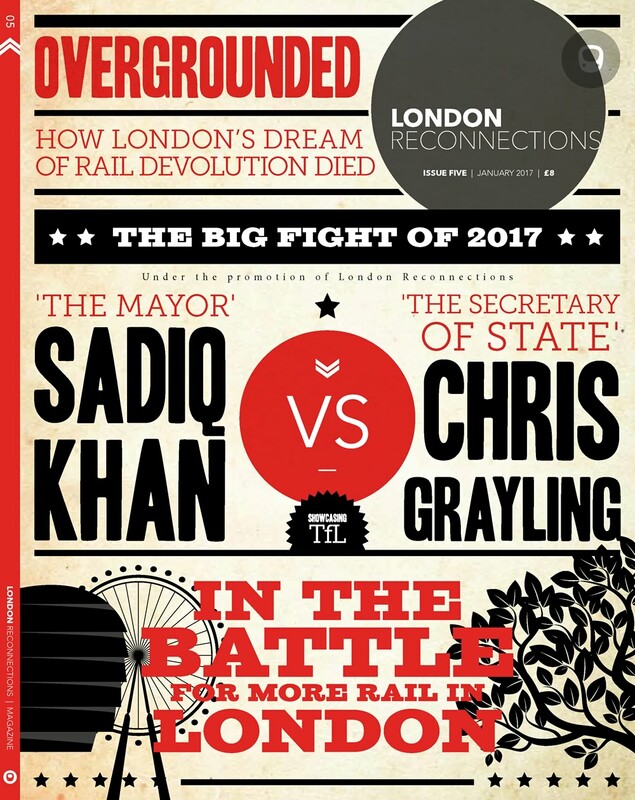 Arguably Crossrail’s ambitions west were curtailed by the lack of electrification, and the dearth of a rail strategy that might provide a trustworthy milieu for investing in and operating such a complex project. In short, Crossrail needed to be ring-fenced from the directionless fragmentation beyond and, sadly, this is still the case. 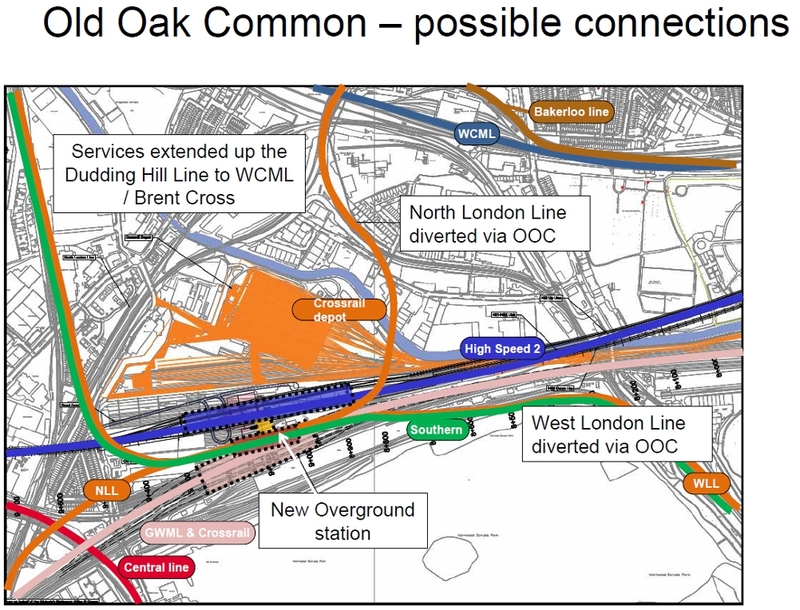 While Crossrail itself presses remorselessly on with the original plan, TfL and Network Rail are actively looking at the route west from the Royal Oak portal. As a baseline, the London & SE RUS envisaged Crossrail services reversing at OOC rather than at Royal Oak. This is now being built into the proposed station at OOC, where Crossrail will have two island platforms, with the two central tracks being for reversing trains. On the RUS diagram above, note the short section on the map in green, from Paddington to OOC. This is delineated as “Extension associated with HS2”, which implies that it is expected to be part of the HS2 plan, and budget. As we shall see in Part 2, this is not an expectation shared by HS2, which is desperately trying to contain its ballooning financial overheads. Mott McDonald has reported to the DfT on the Crossrail-WCML link. Two options are recommended, both using the central Crossrail turnback tracks. One option is to the Dudding Hill line then Acton Canal Wharf route, the other has a tunnel to connect with the WCML near Stonebridge. The latter is the recommended option thought it costs more, because journey times are quicker. The GWML and WCML routes split at OOC, therefore this key junction needs to be grade-separated. Building the grade-separated junction will cost £25 million if constructed at the same time as HS2-GWML interchange, but £50-75m if delayed to later phases. This is another cost which TfL would like to see included in the HS2 bill, but there’s more. The extensive Crossrail depot on the north part of the site is currently being used for the concrete tunnel lining factory. This production line turns out the ring segments which the giant tunnel boring machines (TBM) install as they rumble eastwards. Once the TBMs emerge victorious at the other end, the Crossrail depot will be built here, with maintenance facilities and stabling largely for the Abbey Wood services. 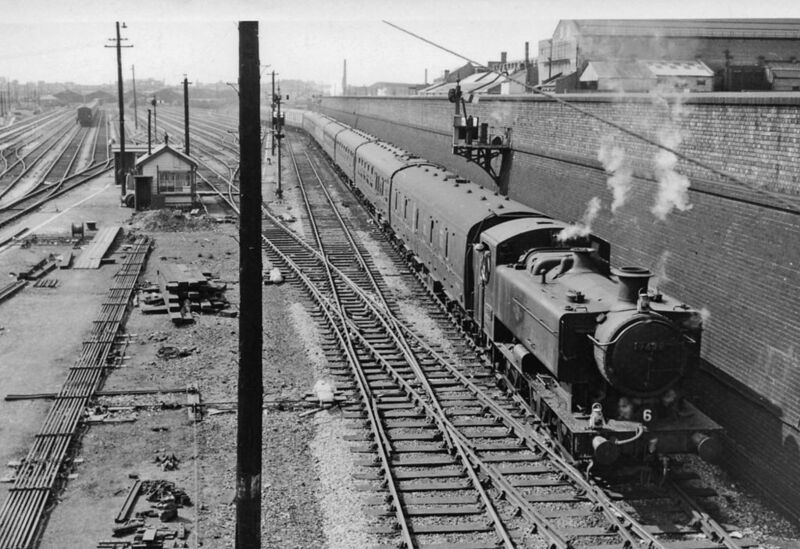 The maintenance depot will occupy the old Coronation Sidings, laid by BR in the 1960s for its Blue Pullman trains, while stabling sidings will fan out to the north on the site of the concrete tunnel lining factory. 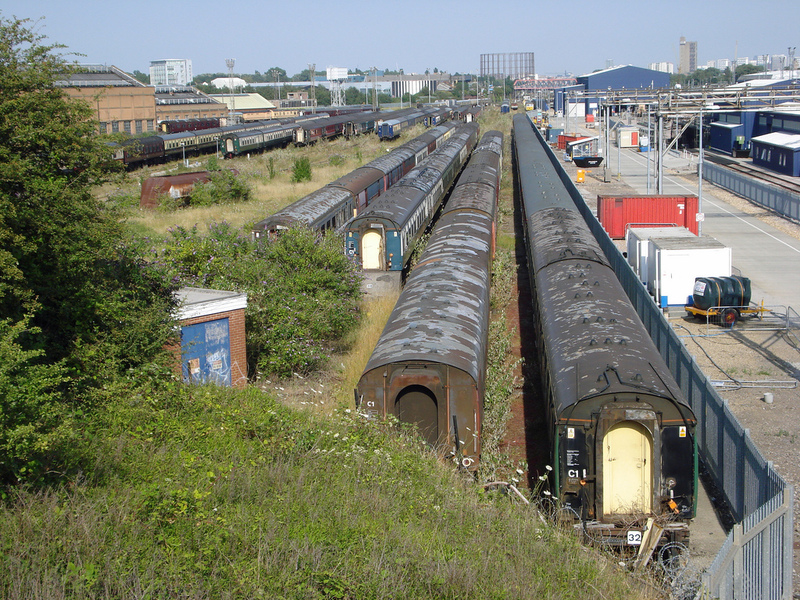 The future Crossrail stabling sidings in 2008 looking east with the First Great Western depot on the right. Photo courtesy of Diamond Geezer. All very straightforward, one might think, but in reality it is the Crossrail depot that is providing the biggest headache for the OOC planners. 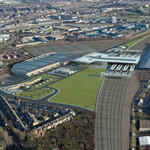 It is partly a question of timing: NR starts work on the Crossrail OOC depot at end-2013 and is due to complete 2018. As currently designed and approved, the Crossrail depot does not allow for development above the site, and it is too late in the day to redesign given the lack of clarity on the other putative components in the grand plan. Worse, for the promoters of the broader Park Royal Opportunity Area redevelopment, the intrusion of the Crossrail depot equates to a real cost in terms of land values and jobs delivered. 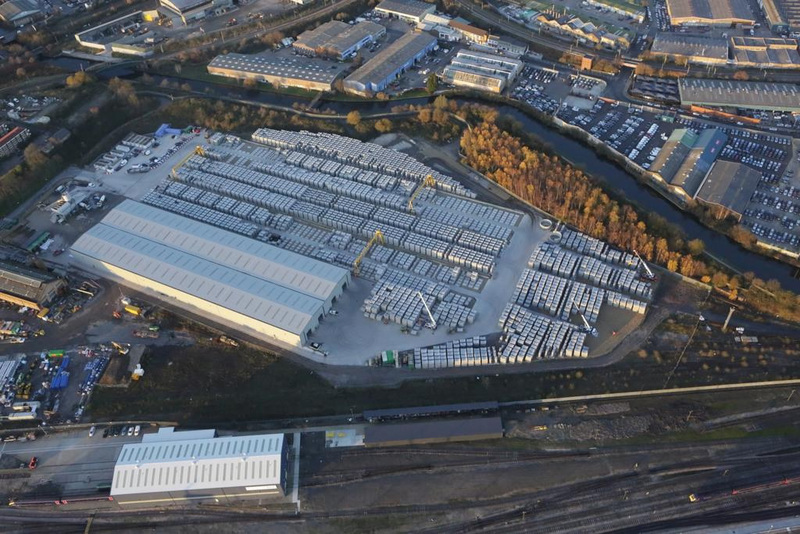 Without the Crossrail depot OOC could provide in excess of 80,000 new jobs, but with the depot occupying the prime commercial site the development can only offer 20-30,000 new jobs. The prospect of apartments and offices overlooking a railway depot slashes property values and tarnishes the sheen of the vision. Most importantly, the land that the depot uses lies centrally at the heart of the redevelopment, on what could be the most lucrative real estate in the whole project. Thus far it has not been possible to see a way forward. In the absence of a clear re-specification and the budget to deliver it, Crossrail will progress as planned. For LR readers exasperated at the nonsense of the Royal Oak turnback, the OOC Crossrail depot could become the most potent symbol yet of our short-term and fragmented rail planning. Crossrail will take over the GWML Relief lines, and the HS2 plans show a mainline station including four platforms on the Fast lines. This would allow some trains to stop and others to run through and would be an essential requirement for the intensive peak service of 20tph on the Fast lines proposed in the RUS (Option A5, p109). The 20tph envisaged in the RUS will run the GWML to its maximum capacity, but this is likely to be necessary anyway by the mid-2020s to meet demand in the outer Thames Valley corridor. Clearly the capacity for a mainline interchange is being built into the OOC design. This would fully realise its potential as a strategic interchange, although it will require a persuasive business case. What of the ‘other’ route west, the erstwhile GW mainline to Birmingham and beyond via High Wycombe? Before HS1, this was England’s newest mainline, built with long passing loops at stations, grade-separated junctions and alignments that favoured fast rail. Long-neglected but revived by Chiltern Railways, the 2011 London & SE RUS expects capacity gaps could be met by train lengthening and service alterations. Yet the 2011 Stations RUS notes the high level of crowding and congestion at Marylebone which is likely to require intervention. Marylebone offers little potential to expand and has relatively poor onward connections. Could the GWML provide an alternative, along with the additional connectivity through OOC? Alas, while aficionados of a holistic and long-term view would see the benefits, safeguarding this route has not been considered possible. Paddington is also unlikely to have much slack with 20tph to service. Perhaps this is a missed opportunity, but in reality it has proved challenging to shoehorn the WCML branch into the OOC design, let alone make provision for the Chiltern route. Still, the alignment at the west end of OOC, where the Banbury route joins the GWML, will be used by the Crossrail WCML branch. Depending on the design of the grade-separated junction and the route chosen through to the WCML, there may still be an option to maintain a connection to the Banbury route, although this does not appear to be part of the current thinking. The North Pole IEP depot was given planning permission in 2011 and will adapt the mothballed Eurostar facility, which lies on the south side of the GWML at Old Oak Common and adjacent to Wormwood Scrubs. The first units to be built as part of the IEP program will be introduced into service on the GWML from 2017. Although not as thorny a problem as the Crossrail depot, in terms of the OOC redevelopment overall the location of the IEP depot here is still far from ideal. At least there is safeguarding in the planning agreement to allow access across the depot from the south side, which makes an Overground station possible here. Nevertheless, this site is also regarded as a Phase 4 project, so for the next twenty years the south side of the redevelopment will be flanked by the IEP depot. Perhaps this is understandable, given the IEP program’s resilience to almost universal criticism, and the contractual commitments that would have to be rewritten with Hitachi. However, it seems perverse given that the North Pole site is so coveted. Furthermore, just to the east on the other side of Mitre Bridge, a large area of railway land is considered surplus, to be released for redevelopment as part of the neighbouring Royal Borough of Kensington & Chelsea (RBKC) Kensal Gasworks Strategic Site. Again, some questions for Part 2. Last but certainly not least, how to integrate TfL’s Overground routes? Those with a penchant for pencilling lines on maps can spend many a happy hour at OOC, with the plethora of potential connections and interchange options. As the CartoMetro map above shows, the WLL from Willesden Junction to Clapham Junction traverses the east end of the site, while the NLL to Richmond crosses the west. Unfortunately the HS2-Crossrail station is located mid-way between and just too far for a convenient interchange. Given that the route from Clapham Junction is likely to be the greatest traffic generator, weaving the WLL into the interchange is a thorny problem that has been furrowing brows at TfL for some time. To complicate matters further, there is also the potential to design in new Overground routes. The two main contenders are north onto the freight-only Dudding Hill line towards Brent Cross and the Midland Mainline, and southwest via Acton Central and onto the Hounslow Loop. 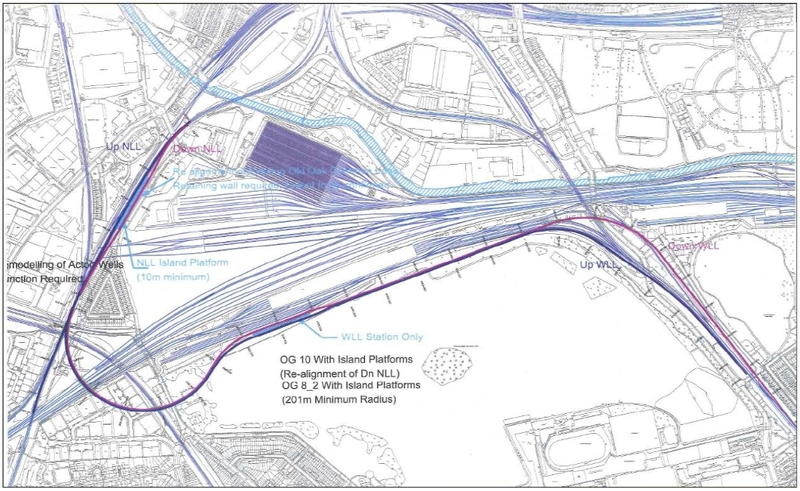 We first became aware that plans were afoot when we came across a TfL presentation at the Golden Mile Transport Group back in February 2012, which showed a new Overground interchange crossing above the HS2-Crossrail station and linking the WLL and NLL routes in both directions. The Overground station as proposed above was found to be unfeasible. Construction and operation of HS2 and Crossrail at OOC would be challenging enough without the complication of a new Overground station emerging in the midst of it. In terms of locating a new station, Overground needed to keep as close to the maelstrom as possible without getting sucked in. An ideal solution would be one that could be ring-fenced itself, and constructed independently of HS2 and Crossrail. So, it was back to the drawing board, and the new options are shown below. It is a neat solution to a complex problem while still offering great flexibility in terms of modularity and future route options. The first option is for a combined WLL/NLL station to the south of the new Intercity Express Program (IEP) depot, adjacent to Wormwood Scrubs. Access to the other platforms would be via a walkway across the IEP depot. This is not ideal but the distance is modest, akin to the footbridge across the depot tracks at Clapham Junction, and offers the best opportunity for a coherent design for access and interchange across the station. It is not clear at this stage whether the platforms and track can be accommodated within the railway lands, tight up against the IEP depot. If not then a strip of Wormwood Scrubs’ Metropolitan Open Land may have to be taken which, though protected, is hoped will be considered an acceptable trade-off for the benefits the new station will bring. 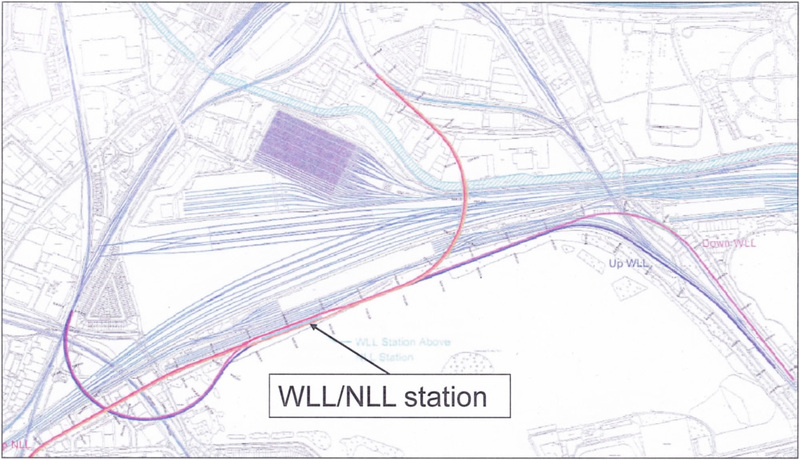 A two-level station is proposed, with the WLL and the NLL routes segregated. With flat junctions, and gradients permitting, an alternative of a large single island platform could serve all routes. While perhaps cheaper to construct, and easier for interchange, such an arrangement would create an operational bottleneck and run the risk of station over-crowding. Travellers familiar with the screech of wheels through Willesden Junction high-level platforms may quiver at the thought of more tortuous curves. In reality the 210m radii are slightly less severe than on the new ELL heading north from Shoreditch, which are 180m. The Shoreditch curve, however, is only a quarter turn, whereas at OOC trains will turn a half circle. Speeds will obviously be slow, but they will be anyway on the approach to the platforms, so this is not considered a problem. On the wise assumption that it may be problematic securing the funds for the ambitious works above, TfL outline two further options. These offer less connectivity but are still viable in terms of service planning. The second option (below) is the one that made it into last week’s Vision document, but that is not to say that the first option has been ditched. It is early days yet. This option jettisons the viaduct over the entire site northwards to Willesden Junction. No doubt this is more achievable in terms of cost and construction feasibility, but it does require a second Overground station at the west end of the OOC site for NLL services. Not only is this some distance away, but loses the neatness of Overground services in one place and adds significant design challenges for the interchange. Alternatively, the station on the south side could be dropped altogether with services calling only on the west side, although this would not serve the Dudding Hill route. The third alternative proposed by TfL is the cheapest, but only provides terminal platforms for the WLL connection. The route through to Clapham Junction is expected to generate the largest traffic flows of all the Overground services through OOC, hence it is served in all of the options above, but again the location of the NLL platforms does not lend itself to ease of interchange or a coherent design for the station overall. What is interesting about these options is that they are not mutually exclusive, in fact they could be regarded as phases towards the grand plan. This modular approach would allow the final sections to be integrated when funds permit, or to fit with the construction program for the main HS2/Crossrail station, with the assumption that passive provision is made. 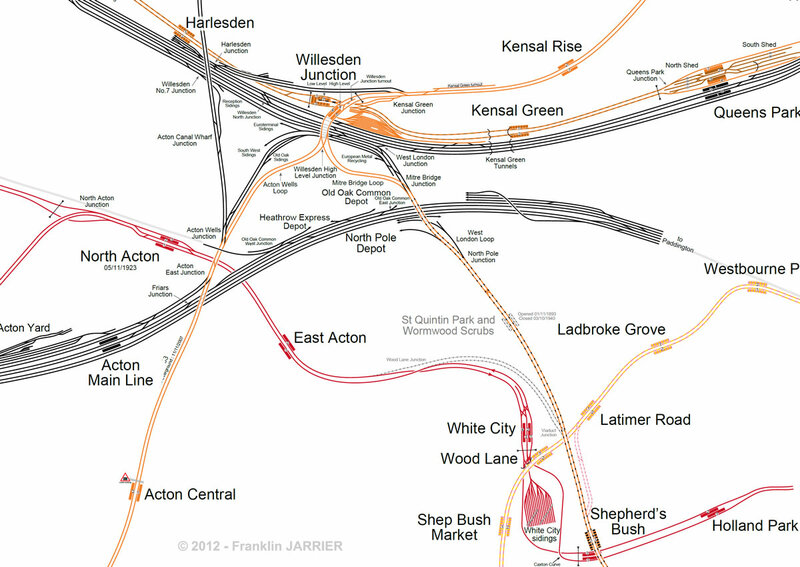 More importantly, this Overground plan could progress independent of HS2, as it skirts around it. In the fragmented planning environment of today, that is a significant advantage, and no doubt one of the reasons this particular design has evolved. We’ll explore the route options in Part 2, along with the implications for other traffic on the WLL such as freight, and the broader planning implications for the orbital routes. To conclude Part 1 (and thanks for making it this far), OOC could become a transformative project for west London and provide a step change for the rail network. But the Mayor’s Old Oak: A Vision for the Future is just that: a vision, and not in any way a statutory planning document or strategy. In Part 2 we delve deeper and try and resolve some nagging questions, then explore the dance between the key players and take a tentative view of how the decision-making might unfold.